P1010043, a photo by megan_n_smith_99 on Flickr. I have not been blogging much but expect to resume my more-usual schedule after the holidays. Well, and I am still looking for a job. This started as a scarf for my friend Janusz but I did not think I would have enough yarn so I decided to make it shorter and add a button. I am not sure cowl is the right word - maybe cravat? The button is one I've been hoarding, it's some sort of agate. I like the irregular shape. The piece is sort of "bumpy" - I could have blocked it but chose not to because I was going for the whole organic look, which went with the greens and browns. I'm almost done with my holiday knitting / crafting / arting. my family is celebrating on New Year's Eve so I got an extension as it were. Reading Mitts, a photo by megan_n_smith_99 on Flickr. I often make a lot of my holiday gifts and this year in particular for economic reasons. I still have a couple of gifts I am working on but so far I've made: 4 pairs of fingerless gloves, 2 scarves, 6 felt ornaments, a pile of crocheted stars a doll sweater, a number of paintings, and 6 pairs of earrings. The gloves shown here are Susie's Reading Mitts. The pattern is available on Ravelry. The yarn is Malabrigo Rios, colorway 872 Purpuras. Since they are reading mitts I had to have a book for a prop! 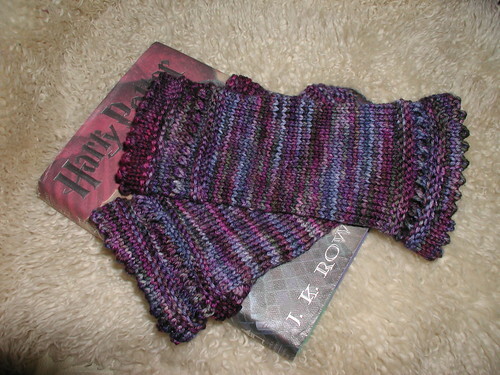 I am sure Dumbledore himself would approve of purple reading mitts. 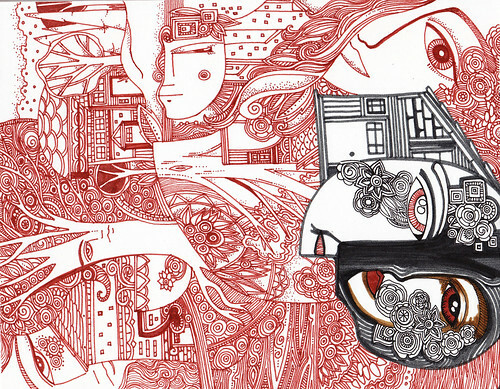 Last week I posted this chance to win one of my original drawings. Elli was the winner! Elli, I need your current address. For the rest of you, tune in around the beginning of January for another chance to win a piece of original art. For the curious, winners are randomly selected by the random number generator at random.org. I came up with this idea and I thought I'd provide you with some instructions. 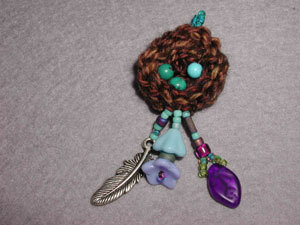 These make cute necklaces, or you could make smaller nests for earrings, or perhaps larger nests for holiday ornaments. Round 1: 2 single crochet in each stitch in the ring. Round 2: 2 single crochet in 1st stitch, 1 single crochet next stitch, repeat till end of round. Round 4: single crochet the whole round. You may continue for a few more repeats of round 4 if desired to make a deeper nest. Finish and work ends in. 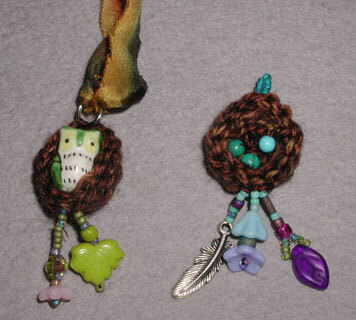 Using your beading thread sew beads into the nest and hanging off the bottom of the nest as fringe. For the blue nest I sewed 3 small turquoise into the nest to look like eggs. I also hung fringe off the bottom of the nest and sewed a split ring to the top of the nest to function as a hanging loop. 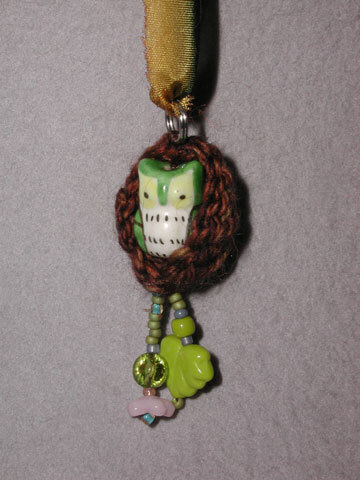 For the green nest i sewed a ceramic owl bead into the nest, hung fringes off the bottom, and sewed a small split ring to the top of the nest to function as a hanging loop. I threaded a hand dyed silk ribbon through the split ring to make a simple necklace. Finish by knotting your beading thread and working the ends in. Holiday Knitting, a photo by megan_n_smith_99 on Flickr. Well, I am getting ready for the holidays, and that means knitting, beading, sewing, and painting. Whew! Well, just a bit of each. Ok, a bit more than a bit of knitting. But my family is exchanging gifts on New Year's Eve I think and some of my friends I probably will not see till after the 25th, which gives me a bit more time! Here we have a sneak peak.. Some malabrigo, I think Rios and DK, and some koigu, and Berroco Geode, and a peak of Manos silk/wool blend. 112906trees, a photo by megan_n_smith_99 on Flickr. This pattern was posted a few years ago by Stefanie Barnes of Littlebirds. I managed to track it down though again though I had to do some hunting. These are easy to make so whip up a few! 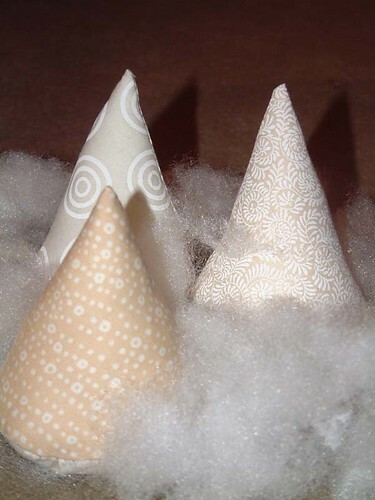 I made mine from lovely quilting fabrics and used fiberfill as "snow"! 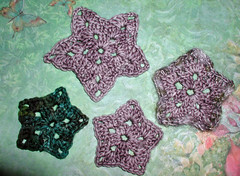 Crocheted Star Ornaments, a photo by megan_n_smith_99 on Flickr. 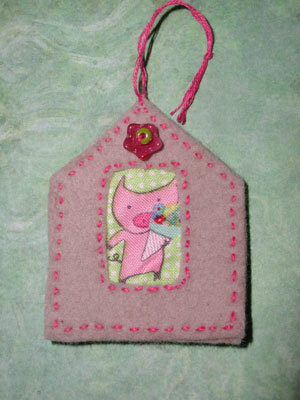 Add a hanging loop and you've got a cute ornament. You can also use them to decorate packages. more acorns!, a photo by megan_n_smith_99 on Flickr. 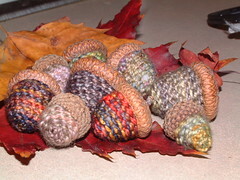 I made these acorns using the tutorial at Resurrection Fern. You can make a whole bunch of these in just a short time and They would make quite fetching holiday ornaments! If you read this post you'll see I started to re-share an article the the 7th issue of the zine I used to publish, Mysterium. It's amazing how much I had forgotten about. Here are some decorating tips I'll share again. * Decorate with maps. If they are old or valuable, make sure to use color copies. You can line drawers or cupboards with them, hang them on the wall, etc. I've always wanted to make my own globe. I reckon the best way to do this would be to buy an inexpensive school globe, gesso it, and then paint my own stuff over top. Do not do this with an old globe without checking to see if it is valuable. Do use old valuable globe to enhance your decor, but don't alter them! * Hang beads off random items of furniture. This is easy to do. Just drill tiny holes or attach tiny eye hooks. Then you can hang beads off shelves, chairs, tables, you name it. You can never have too many beads. * I had this idea for a bubble wrap shower curtain. You can buy it in rolls. Simply piece together with clear packing tape and hang. (It is even better if you can get a tall enough piece so that no piecing is involved.) When stressed out, pop the bubbles. When the bubbles are used up, make a new one. * Do paint scenes on the back of your bookshelves (or collage them) and paint or collage the insides of closest or cupboard doors. We all need a little more excitement in life. Use acrylic paint for this. * Decorate with your collections, whatever they are. I have decorated with jewelry and evening purses, scarves, and even a beaded velvet jacket hanging on my wall. One of my cousins has her vintage rolling pin collection hanging on her kitchen wall. * On those days when you have an urge to nest but no extra funds you can still go outside and collect leaves, flowers, twigs, shells, and whatever it is that you can find in your neck of the woods, and make a table arrangement. Be creative and use things in unusual ways! * If you can find, beg, borrow or steal and old decrepit dresser you can do interesting things with the drawers. Remove the hardware, paint and embellish, add partitions and hang on the wall for curious. Or you can add little shelves going across and them and use to store small items like thread, containers of beads, and mounted rubber stamps. You can even add a glass top, fill with art of curious, and add legs to make an unusual coffee table or end table. * Things can go together without matching. Pick a color scheme and collect tableware, linens, etc. in those colors. You don't have to spend a lot. You can buy from open stock or thrift stores. I like the little bowls and things you can get in Japanese stores. Next time you entertain mix and match! Or even make each place setting a different color. This would brighten up any winter day. * As may be clear by now, I am crazy about crows. I like to get those little crow figures in flower shops -- the ones with the real feathers -- and perch them on nails on my wall. They look good over doors and windows. You can scatter tiny fake nests around too. I have some on my window sill. Also, blow out eggs or dye or paint them to look like natural birds' eggs. Some eggs are amazingly pretty and would be fun to copy. I always like to have some leaves, feathers, shells, beach glass, and maple whorls scattered around too, in little bowls on sills and ledges. 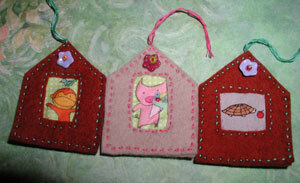 They are handy for instant art fodder and look homey too. i was just rereading some things in the 7th issue of my zine, Mysterium. It's amazing how much I had forgotten about. Here are some decorating tips I'll share again. I will break this up over 2 days. Home Sweet Home: Embellish it! * Go a little crazy with fringe, if you like. You can purchase beaded or fiber fringe by the yard and add to curtains, lamps, chairs, sofas, pillows, etc., OR you can make your own fringe. * Remember anything can be artsy so do dress up your mirrors, light switch covers, and picture frames. You can paint them, collage them, glue beads or trinkets to them, etc. *Art in unexpected places is also good. The bottoms of drawers, cupboards, closets. Don't be afraid to play. If you don't own your own place you can do art on canvas or similar material that is cut to fit and then take it with you when you move. * Get weird old furniture from thrift stores, garage sales, or the attic. Clean, sand, prime, and GO! Paint, glue, draw, and more. You may want to seal when you are done with polyurethane or non-yellowing shellac, depending on what you will do with your creations. ALWAYS read the directions on your products. Use outdoors or with good ventilation, wear gloves and keep kids and pets away. Wear dust masks for sanding and painting. If you plan to do a lot of work with other toxic materials consider getting a respirator. A dust mask only keeps out particulates, not fumes. *Take a little field trip to the hardware store. They have tons of cool toys: new knobs, new legs for existing furniture (or build your own new piece), and fancy moldings and trim you can add to things, and more. Just go explore and get ideas. nature spirit 2, a photo by megan_n_smith_99 on Flickr. I have been under the weather for a few days, hence no blogging. i am feeling a little better today, but still tired. i am trying to slowly get caught up on some things even if that means taking lots of (ok almost constant?) breaks. 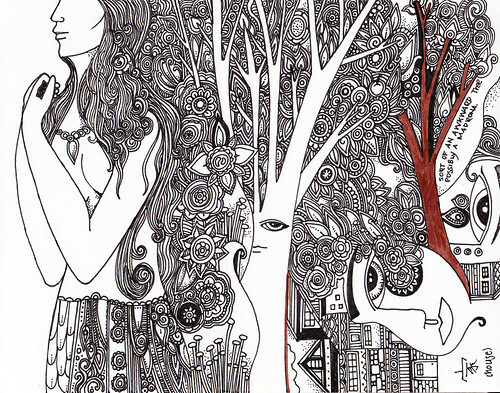 so due to that this month's give away is not a new piece of art, but it from 2010. I just looked at it again and I really like it and I hope you do too. Click on the image to see larger. Leave a comment if you want a chance to win. A winner will be randomly selected on Saturday December 17th! Cheers. Seed Stitch Scarf, a photo by megan_n_smith_99 on Flickr. I made this scarf this weekend. I have not decided what I will do with it yet... maybe it will be a present for someone. 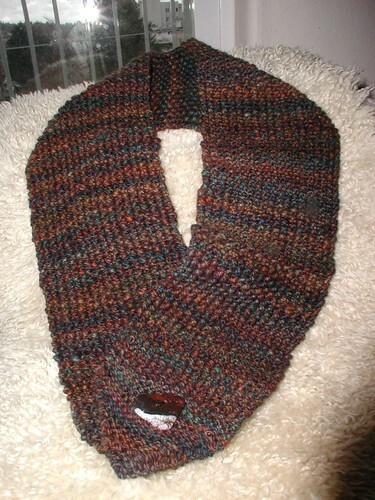 Finished Size: 40 x 5"
The yarn is mostly a sort of rust / olive with flecks of a lot of other colors, mostly warm colors. I knit most of it this weekend visiting friends. My friend Karen and I had a nice afternoon of knitting and playing with the kids on Friday then I spent the night and yesterday we went out to pancakes and they had a gluten free menu! i got pancakes! then we went out to a u-cut tree farm near the foothills. ingrid (age 4) and I had a lovely little nature walk. we admired the different trees. we looked to see how you could tell new growth from old growth. i explained how fir needles are specialized leaves. we examined the little nubbins that will turn into pine cones. we counted tree rings on some of the stumps to see how old the trees were. she found some snail shells and we took home the empty ones. she took home a pine cone. we found many different types of mushrooms, some teensy, and some self / bracket fungus which i love. we even saw some deer poop. Do deer eat Christmas trees? 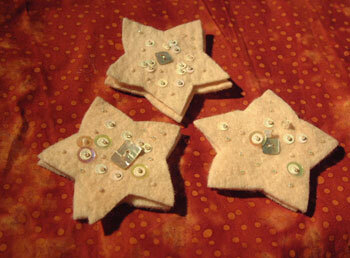 A few years ago I posted a tutorial for making holiday star ornament. Check it out if you'd like to make your own stars! If you read this post, you know I used to publish a zine called Mysterium. For your reading pleasure I have been sharing 100 holiday ideas from an issue published in 2002. The world has changed since then, and I have changed as well, but some of these are still good ideas! 91) If you can manage a sleigh ride, or a horse-drawn buggy ride, that would be excellent. 92) Make eggnog, or mulled cider, from scratch. 93) Light a candle on Winter Solstice. Better yet, make candles and or decorate candles you have purchased. 94) Have a gift wrapping contest amongst your immediate family. Have silly prizes for the most beautiful, the most original, the most deceiving, etc. 95) Do something nice that no one else will ever know about. Clean out the microwave or fridge at work, shovel someone's walk, throw out litter you find lying about, etc. 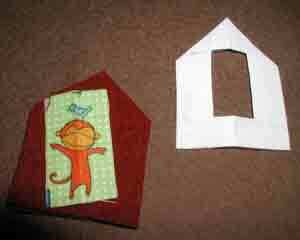 96) Make puppets out of paper lunch sacks or old socks and have a puppet show. 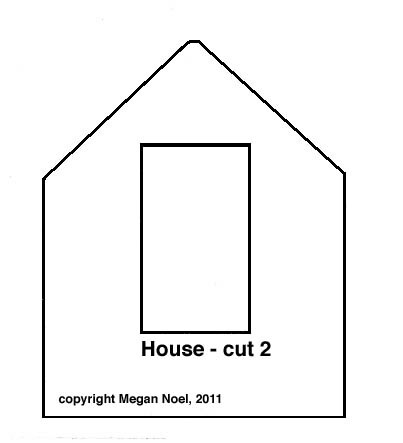 97) Make your own advent calender. Save it to use again next year! 98) Start a holiday chain letter with family members, sharing favorite memories. Just don't threaten anyone with bad luck if they do not forward it! 99) Have a progressive dinner with friends. That way each person only has to prepare one dish. I suppose everyone needs to tidy up a bit. 100) Tell someone that you love them. Or a lot of people. 81) Dig out the family recipe books and make at least 1 thing your grandmother always made at the holidays and you've always wanted to make. Or, if you hate to cook, resolve to buy all your holiday cookies this year, thereby single-handedly rescuing the baked goods industry from the recession. 82) On New Year's day write letters to your political representatives, letting them know what kind of city / county / state / nation / world you would like to live in during the next year. 83) If you must make New Year's resolutions, be kind to yourself. 84) If you do like to bake, make nontraditional cookies, like red and green turtles, Bumbles, dancing mice, etc. 85) Read Shakespeare's Twelfth Night on January 6th. 86) If you make holiday cookies consider making gingerbread men and women who look like family members or friends. And don't forget pets! 87) If possible, sit at the "kid's table" this year. I am sure you will have more fun. 88) If you have children, sprinkle glitter on their windowsills while they are asleep and tell them the frost fairies did it. 89) If you find yourself restless and have cabin fever, set up a tent in your living room and sleep in there. If you don't have a tent, make a fort out of blankets and cushions. 90) Make up stories about your child's favorite toy, or make up stories about toys you had as a child. Stay tuned next time for the last 10 ideas! 71) Use your computer to create your own mad libs and choose your own adventure stories. Print out, bind, and give to your playful friends and relatives for holiday gifts. 72) Make a loved on a "to-do" jar and fill it with fun suggestions-- write a story -- take a walk -- give someone a hug -- go to a movie, etc. This would also be good to do with kids over holiday break from school. 73) If traditional holidays stress you out, invent your own. Also you can find some lists of weird holidays on-line. When is Yeti day? 75) Make your OWN list of 100 holiday ideas because I am having a hard time thinking of 100 ideas and they might start getting silly from here on out. 76) Leave a plate of cookies out for Santa, and a carrot for the raindeer, and some yak jerky for Bumble. 78) Try making a holiday wreath out of the weirdest things you can think of. Also try making an edible wreath out of the weirdest things you can think of. 79) Make snowmen out of marshmallows and watch them melt in your cocoa. Then drink it. Provide sound effects. 80) Especially if you live in Florida, make a huge batch of popcorn balls and have a faux snowball fight. tune in next time for more ideas! 20 left to go! 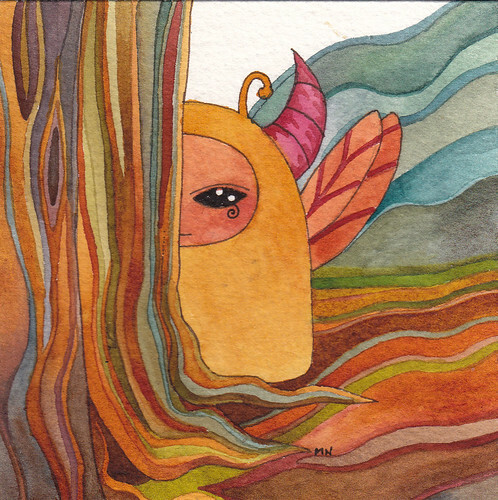 Just to let you know, I will be giving away another little painting in the next few days. Check back for your chance to win! 61) Don't give anyone pickle forks this year. Well, MAYBE if they specifically ask for them, but even then give it a second thought. 63) Not for the faint of heart, but a made-up game would be super cool as a gift. Either alter an existing game board with paint, etc., or start from scratch. Concentration would be an easy game to make using color copies of your art or family photos. Games can involve cards, boards, playing pieces, etc. 64) If you and your partner or roommate have been putting off something forever, perhaps cleaning out the oven (which has burnt-on dinosaur roast stuck to the bottom,) or the fridge (yuck!) surprise them by taking care of it.. Um, wear gloves, masks, those little tyvek suits... I wish they made self-cleaning fridges. 65) Make your own magnetic poetry using a printer, laminator, and sticky magnets from your local office supply store. Or you can hand print the words in vivid colors and laminate them magnetize! Be sure to include good words like "Bumble" and "Mysterium." 66) If you are a little short this year try taking your loose change to the bank. One of my friends just did this and it was over 100 dollars -- yikes! 67) can you say gift certificates? No mess, no fuss, no lines at the Post Office. Some suggestions: powells.com (an independent bookstore!) Daniel Smith, and your favorite Etsy shops. 68) Zines! Zines make good gifts and also, no lines. A gift that keeps on giving. [Ed. note: there are not as many zines out there as there once were but there still are some. Magazine subscriptions are good gifts too. 69) Another idea Martha probably stole from someplace, make your own snow globes. Take a small jar, such as a baby food jar, glue some cool stuff inside the lid, fill with water, glitter, and a drop of glycerine and screw the top on. 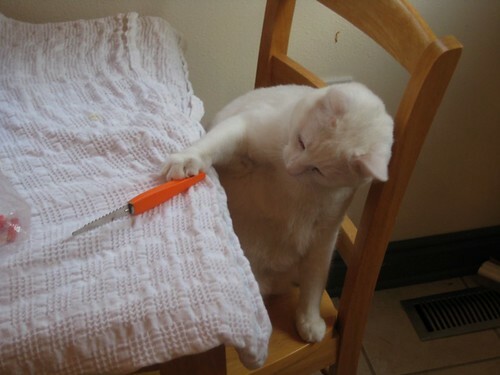 seal it with silicon caulk. Shake and have fun! Don't use any materials that will immediately rust or fall apart under the influence of water. 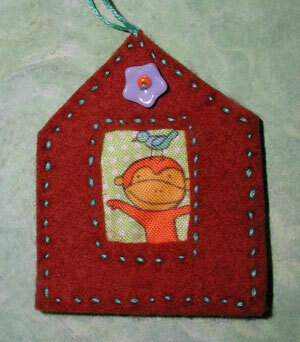 70) Trace around cool cookie cutters on felt, cut out, and whip stitch shut for fast ornaments. Glue or sew on beads and sequins if desired. more tomorrow! 70 down, 30 more to go. Here, in Autumn, a photo by megan_n_smith_99 on Flickr. Well, I really did not feel well yesterday and did not get much done. I was in a lot of pain and lying down was the least painful position. I watched some X-files and listened to part of an audio book. today has been better. I met my mother and we had lunch together. We traded some handiwork.. I had knitted someone for her to gift and she had something woven for me to gift. Trading is a handy thing. fingerless gloves, a photo by megan_n_smith_99 on Flickr. these are some of the knitting i did on the train and over the thanksgiving weekend... i am not very good at sitting and doing nothing. i am not even very good at sitting and doing just one thing. i am better at doing at least 2 things at once, though i think it would be better if i could do less. anyway i knit these while glancing up at passing scenery. 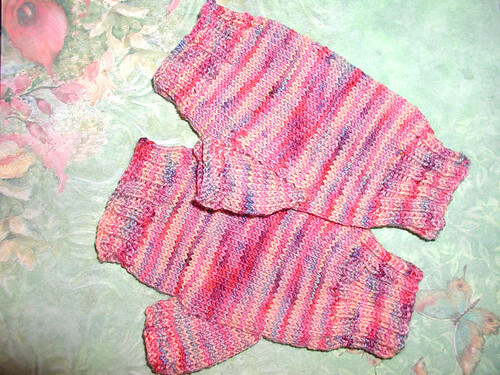 when it got dark out i knit these while listening to the 2nd Hunger Games audio book (Catching Fire by Suzanne Collins). I have no idea why i bought this yarn, but i bought 2 skeins! and it was perfect for the recipient. 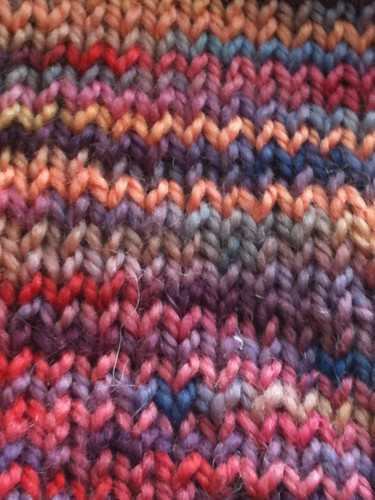 It's Koigu Painter's Palette Premium Merino, 1 skein. There were some leftovers too so I crocheted a scarf for my stuffed mouse because you know it's important to keep warm! Not sure what I will do with the 2nd skein. Any suggestions? Jade Bird, a photo by megan_n_smith_99 on Flickr. 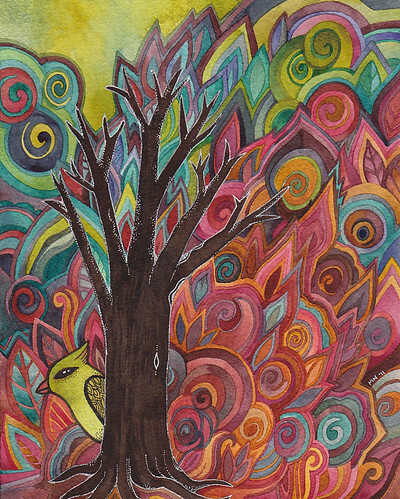 51) I might be wacky but I like to spend New Year's Day thinking and writing and doing art, spending a quiet calm day. It is also a good day for a fresh start. One year I redid all my shelf paper - we're talking excitement! It is also a good time to start a project you intend to continue through the year - a journal, a quilt, etc. 52) People with pets will appreciate pet care products as gifts but first spy on them a little to see what brand they prefer, since kitties may turn their nose up at the "wrong" brand. This is nice for someone on a fixed income, you know they will use it. 53) Gel pens! They make good gifts for artsy friends I also like Pitt Artist's Pens and Micron Pigma Pens. 54) If you can manage it you can give artist friends something they can use in their art. I've given knitters hand-made buttons. (I've made them from polymer and have made beaded buttons.) Handmade faces (drawn, sculpted, carved etc) can be great for doll-makers, etc. Handmade or purchased art paper would be a great gift for any sort of visual artist. Get creative! 55) Make sure you watch the Rudolph special. Bumble is so cool - yah Bumble! 56) If you write, write stories specifically for your friends. This is a great projects for kids to do, with help if they are younger. Or write parodies of favorite fairy tales or classic stories. Harold and the Purple Crayon is an easy book to parody, for instance. Print and bind your books, or have it done at your local copy store. 57) Firewood can be a useful gift for people with fireplaces, especially if their house is chilly or they live in a place prone to power outages. 59) Once year I started a Yoga class on January 2nd. It met every weekday morning for a month. It was a great experience though I am not sure I can convince myself to get up every morning at 5:45 again. 60) Have a blue collar holiday - nachos, beer, bingo, and bowling. Or select another theme for your holiday. Fondue? Do you still have your fondue set? Check the buffet next to the pickle forks. 41) More cool stuff to make: tea blends, bath salts, lavender sachets. 42) Handmade stationary and envelopes would also be a cool idea. Or even just envelopes. You can take apart a purchased envelope and make a template then make your own envelopes out of wrapping paper, art paper, magazine ages, junk mail, sheet music, old maps, etc. 43) I am not a huge Martha Stewart junky but recently she had some votive candles sunk in the show, lining a walkway, that were super cool. And I think it was last year that she froze berries and leaves and stuff n ice and set it out as decorations -- fun and cheap, though not good if you live in Seattle like I do -- drip drip. 44) I think it would be ever so nice to just go for a drive on the holidays and ignore the stressful family stuff (unless it isn't). But if you do that make sure you have plenty of gas and snacks and stuff like that. You'll probably have the beach or the forest to yourself. Oh, bring something for he squirrels. I worry about them in winter. 45) Did you roll pine cones in peanut butter and birdseed and hang them out when you were a kid? Weren't you a Girl Scout? That was fun. For that matter bird baths and bird houses and bird feeders can be nice gifts for the homebound, it gives you something better to watch than CNN. You can get those bird feeders with suction cups that stick to the window. But if you get Aunt Mildred a birdhouse you may need to fill it for her. 47) When I was growing up one of my girlfriends made a really cool gingerbread house out of graham crackers. It is not really cheating! Just add frosting and candy and look at all the time you saved. 48) For that matter take the leftover graham crackers and put frosting or ice cream between them, mmm. Also, I have been known to make pie crust treats just for the heck of it when i was not even making a pie. Roll out piecrust and sprinkle with cinnamon and sugar. Roll up into little logs and bake. I used to love it when my mother made these. 49) I have a huge cookie cutter collection (er, like over 100 probably.) Weird shaped cookie cutters are a nice gift for bakers. Among my cookie cutters the VW bugs are always popular. If you can't find a good selection locally you can check on-line too. 50). This holiday season remember - recycle, reduce, reuse. I almost always reuse tissue paper! Stanzas, a photo by megan_n_smith_99 on Flickr. 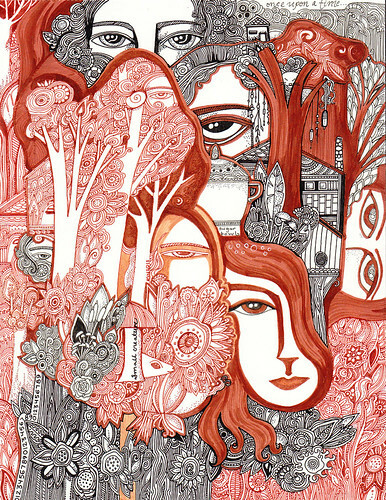 This is my latest pen and ink drawing. Most of it was done while listening to the audio books of The Hunger Games trilogy. I think I started it last week - then found it waiting for me when I got home from my trip to Eugene. Most of my art is pretty free form ... I do not usually start with a plan in mind but after I've gone a little ways a plan will usually suggest itself to me. 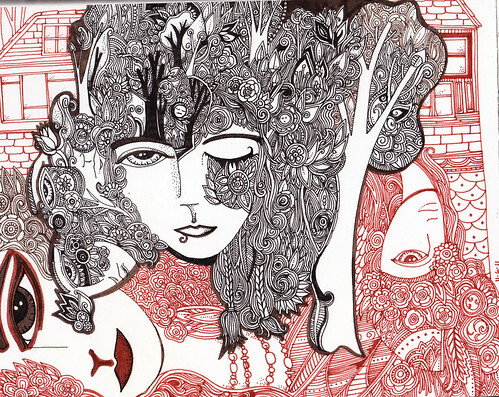 This drawing is 8 x 11.5" on Aquabee Bee paper using pitt pens, sizes s, f, and b. Holiday Ideas (continued) by Megan Noel, 2002, and 2011. 31. Give the gift of time, whatever you are good at: Bike repair, car repair, cooking, baking, leaning, weeding, painting, cutting hair, etc. I mean, who doesn't want a few more hours in the day and that is basically what you'd be giving and it would not cost an arm and a leg either. 32. If you want to have some sort of holiday gathering, try something non-traditional like cooking making, card marking, ornament making, etc. If, on the other hand, you never want to see anyone ever again it is also okay to tell everyone you are going to Hawaii and then just stay home and ready trashy novels. 33. Personally it would be fine with me if one of my friends swapped trashy novels with me - you know i have about a years worth of books worth reading once and NOT worth reading twice and it would be fine with me to swap for a friend's stack. 34. I assume if you are reading this zine [where this was originally published] then you are a tiny bit creative. Get together with your other creative friends either in person or through the internet and swap hand-made stuff to give as gifts. In case your family does not ever want another pair of hand beaded earrings, maybe they would like some handmade soap or something else, and vice versa. 35. If you want to, decorate with all your favorite stuff, whether it is "appropriate" or not. Last year I had my Harry Potter legos under the Christmas tree and the year before that it was stuffed animals. 36. I particularly enjoy rereading my favorite classics around the holidays. You can do this as a family or with friends, too. Some suggestions: The Narnia books, The Little House on the Prairie books, Edgar Eager, E. Nesbit, etc. The same goes for old movies. 37. My favorite very easy and cheap gift wrap technique: Wrap gift in brown kraft paper. Write the recipients address and your return address as though you were going to mail it. Wrap with string (tea-dyed if desired) an stick on either some real holiday postage stamps, or cool old stamps, or a postoid rubber stamp. Or make your own holiday faux postage. 38. My mother used to get stocking stuffers at the grocery store. I appreciated getting stuff I always run out of like moisturizer, rolls of quarters for laundry, etc. This is especially good for students and starving artists. 39. If you ARE a starving artist, make a deal with all your other starving artist friends to skip the gift exchange and just go out to dinner together, or coffee together, or a movie, depending on how starving you are. 40. If you are not broke and starving feel free to wonder what I am talking about! tune in tomorrow for 10 more holiday ideas and some art show and tell! I am having a sale in my etsy shop, today and tomorrow. coupon code HOL2011 to save 15%. www.meinoel.etsy.com. I'll be posting some more holiday ideas later today! i got home from my jaunt to Eugene Oregon late last night and am planning to lie around in my pajamas for a while. 22) I mentioned stationary, but really STAMPS. The postage kind I mean. Everyone uses them. You can get fun ones. Yu can even get them from the post office website and not have to stand in line. Someone please give some to my coworker Jeremy who keeps using mine. Anyway It’s a gift you know will be used. 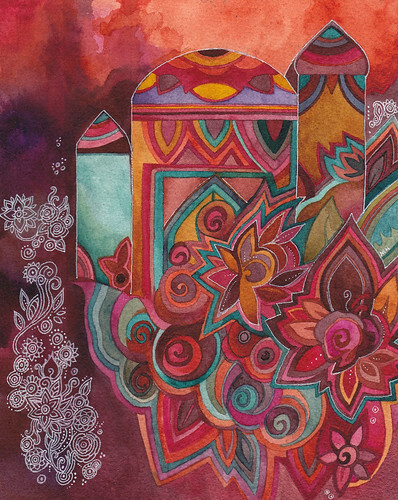 24) A journal kit would be nice; especially to encourage someone knew to art journaling. 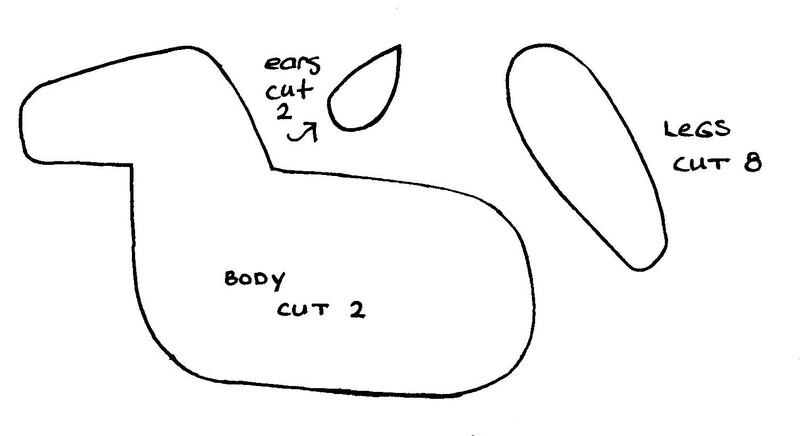 I suggest you keep it simple, a glue stick, some gel pens, and a small ruler for measuring or tearing. Then add whatever suits the recipient, a portable watercolor set, some colored pencils, stickers, etc. 25) Personally I would love it if I came home one day and my laundry was done, my dry-cleaning was dropped off, my mending and ironing were done. That would be a real treat. So especially if you are trying to keep things simple this year and get away from all the “stuff”, consider a gift like this for your roommate or partner. 26) Another gift for your partner or roommate if you are trying to simplify, walk the dog. Take out the garbage, do the dishes, whatever chore they hate for a week, or a month, or however long they deserve a break for! 27) For a change of perspective, if you are inclined to be critical, try going a whole day without criticizing anyone or anything. If you are meek, try going a whole day without swallowing your words. Or, if that’s too much, try an hour. I need to do this! 28) Take time for yourself during this stressful time – whatever that means for you… art time, writing time, time to run or do yoga, a trip to the gym or a coffee shop, a hot bath, something just for you. Do this every day. Especially if you have company staying with you. 29) Have a Prairie Home Christmas. Tuna Hotdish, white bread with butter, green bean casserole, and Jell-o Salad. That sounds easier than cooking an enormous turkey. 30) One thing I like to do when I make gifts is to not bother giving hem on time. I mean I always figure anything before Twelfth Night still counted. Someone else pointed out to me that really anything before the end of winter could count. So that gives you a lot of flexibility and your friends and family get something to look forward to … eventually. 11) A gift idea for someone who writes a lot of letters... a box of cards, stationary, stamps, etc. If you want to get really fancy, include hand made cards and faux postage along with the regular kind of postage. 12) Film is a good gift, and so is a gift certificate for processing film, This is a gift you know will be used and appreciated. Well, if you give it to someone with a camera that is. OK, now that is REALLY dated. So how about batteries, smart media cards, a handy camera case, or photo paper? 13) Start your own holiday traditions. Personally I have been collecting my favorite holiday movies on DVD. The Muppet Christmas Carol and A Wish for Wings that Work are high on my list. This year I think I will add Meet me in St. Louis. That's not technically a holiday film but it ends at Christmas and feels Christmasy to me. 15) Another way to check out of the stress is to make all your presents (HA! HA! HA!) or just pare your list way back to immediate family and very close friends, or just give cards. It's supposed to be fun - right? Not agony. Your Great Aunt Mildred will probably be relieved she doesn't have to crochet you another potholder next year. Be bold enough to break the cycle of meaningless gift exchange. 16) For your family and friends with kids, if you do feel inclined to give them something, rather than another toy or book how about if you just baby-sit so they can go out and do something by themselves, or take the kids for a day so they can stay home and be lazy by themselves. 17) If you are feeling cranky--that EVERYONE is going someplace for the holidays and you aren't--offer to water their plants, feed their cats, and cover for your coworkers. At least it makes me feel better to think about someone else rather than feeling grumpy, though I am good at that too. 18) Amidst all the stress and expectations, keep in mind that you don't have to please or impress your mother, your grandmother, your aunts, your kids, your pets, your partner, or your neighbors. And remind me of this from time to time if you don't mind. 19) If you think holiday decorations are too much work, don't bother. On the other hand, if you live alone and you think it's silly to put all that work into it when no one will see it -- but you always WANT to -- do it for yourself. Or do something weird. 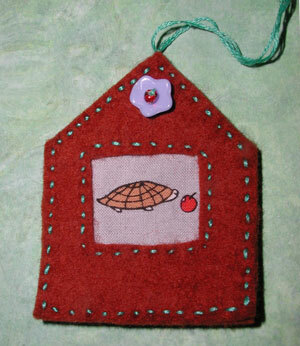 Get your turtle collection out, decorate your potted palm, decorate in some unconventional way. Or decorate for some other holiday, oh that makes me feel sneaky -- a Christmas tree with Halloween decorations on it. A Christmas tree with flamingos. Whatever. 20) Put lights in weird places. I used to have them in my bathroom. I also had a clear shower curtain so I could look at them through the drops of water when I took a shower. It was very relaxing. Oh, and leave them up. Fossil Flowers in Landscape, a photo by megan_n_smith_99 on Flickr. I got this watercolor paper recently. I was attracted to the size but had never used the paper before. It is a block --Fluid 140 lbs cold press. It won't stand up to the sort of mixing on paper I do on Arches 300 lb coldpress so I have been backing off on that and doing more glazing. Still learning what works best on this paper, but I am attracted to the vertical format. So here is the latest in the Fossil Flower series. It's 6 x 12 inches. It's available on Etsy. doodle, a photo by megan_n_smith_99 on Flickr. 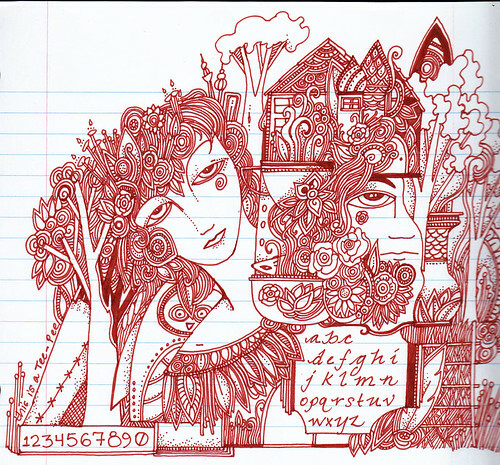 it has now been shown that doodling improves concentration and memory. so i feel ok that i doodled some today during a presentation. 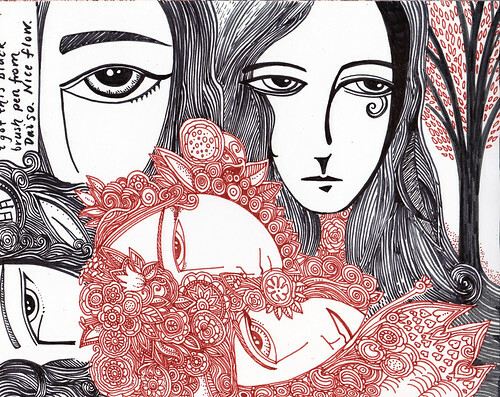 Those of you who have been following my art for a while know that I used to publish a zine or two. My two regular zines were Mysterium and La Luna, and there were some on-offs as well. I still have a few zines left storage and may be listing some on Etsy if there is interest. Also I have decided to make some content available on-line. So, here we go, 100 Holiday Ideas, by Megan Noel, 2002, with some edits made 2011. 1) To celebrate Autumn, have some fun with leaves. Press leaves overnight in a book, just to flatten them. Then lay them out on black paper and sponge paint around them. I prefer Lumiere, especially the Halo colors. You can get an interesting effect. Try any acrylic paint, metallic if you prefer. 2) Try tracing around leaves and then drawing inside the shapes with ink, crayon, etc. 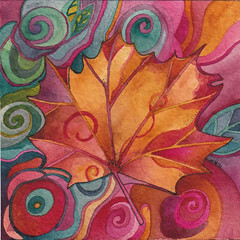 Or do the same on watercolor paper and do layering and glazing so it looks like some leaves are lying on top of others. For kids I would trace large leaves with sharpie and let them color the rest with crayons. 3) Make acorn beads. It works best to pick slightly green acorns and punch holes in them with an awl. They will naturally dry to the usual brown color. You can try this with brown acorns but they are more likely to crack. Also you might need to glue the caps on with white glue or wood glue, because they are prone to falling off. You can leave the acorns natural or spray with metallic spray paint. 4) Pretend you are back in grade school and iron leaves between layers of waxed paper. We used to make place mats. 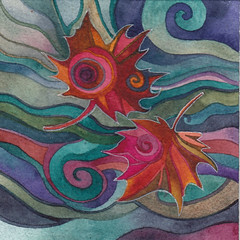 5) Don't forget to collect cool autumn stuff to use in your art, twigs, acorns, seeds, maple whorls, etc. You can dry them and store them in plastic containers or zip-lock bags. If you leave near the beach this might be a good time to stock up on shells, bits of driftwood, etc., unless you like cold walks on the beach in winter. 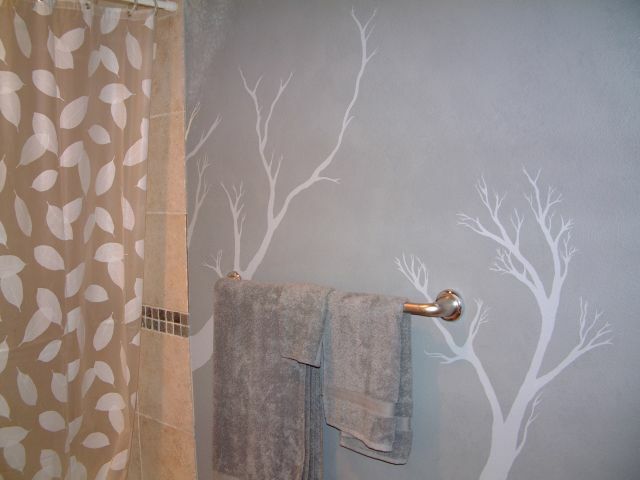 6) Hmm, I have not tried this yet but I wonder if it would work to emboss velvet with leaves? Mist the velvet with a spray bottle, arrange the leaves on top of your ironing board, lay the velvet over the leaves with the good side up, cover with a pressing cloth, and press briefly on the appropriate iron setting for your fabric content. Or try the same using leaf rubber stamps. 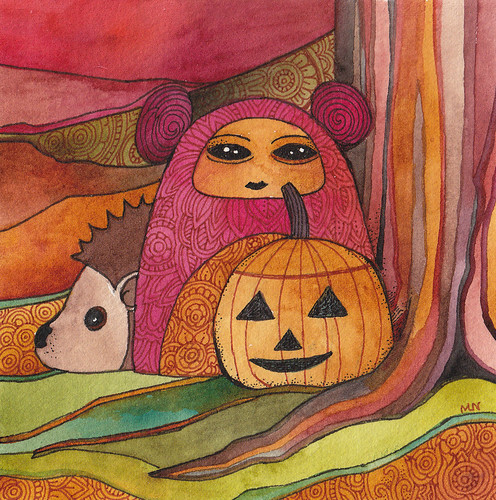 7) Send out Halloween cards, or Day of the Dead cards, or Thanksgiving cards. Everyone likes getting unexpected mail. Postcards are good too if you want to save on postage. 8) If you are expecting small holiday guests and want to keep them amused draw an interesting picture on 11 x 17" paper. If you can't draw, use clipart or art from coloring books. Take this to your copy store and have it photocopied onto 11 x 17" card stock, Now use these for your holiday place mats. Add small boxes of crayons and you are set. Adults might like this too, anyway, I know I would. 9) On the note of coloring, make your own coloring book to give to your artistically inclined friends. 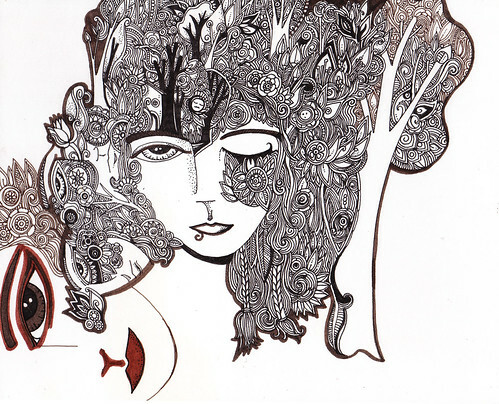 Again use your own line art or clip art, print it or have it photocopied onto nice paper. Your local copy store can bind it inexpensively, or you can bind it yourself if you are into bookbinding. 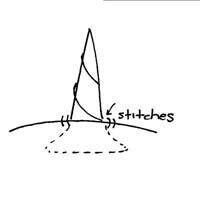 I recommend a stab binding or pamphlet stitch. Add a few beads to spruce it up. Wrap it up with a box or crayons or markers. 10) If you are an artist, writer, or other creator-on-paper, make a holiday zine or booklet to give to your friends. Use art, poetry, stories, etc. Have it printed and bound at your local copy store or do it yourself. 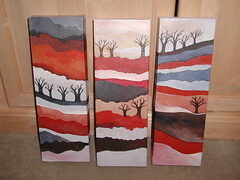 This won't cost much and is an inexpensive way to share your artistic vision with family and friends. stay tuned for 90 more ideas in blog entries to come! Fossil Flowers 2, a photo by megan_n_smith_99 on Flickr. Based on the number of people who "favorited" my original Fossil Flowers painting on Etsy and Flickr, it's one of my more popular paintings (and still available on Etsy.) The original concept for that painting was for a longer leaner look - it ended up being 5 x 7" but this painting, Fossil Flowers 2, is more what I was originally going for. I think I will be exploring this idea a bit more. 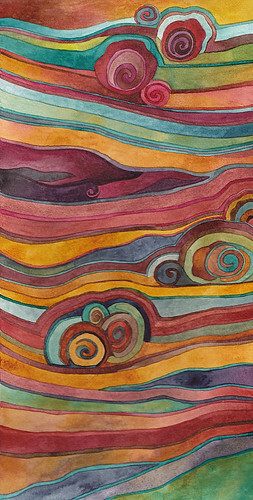 They are sort of the watercolor versions of my Strata series but different too. We'll see what happens. I am liking this size, 12 x 6". Autumn Canopy, a photo by megan_n_smith_99 on Flickr. Knitting, a photo by megan_n_smith_99 on Flickr. I feel like I have not had a whole lot to say lately. 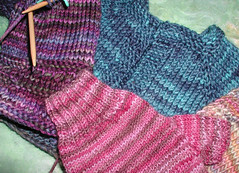 This is something I am knitting - maybe I will show you when it is done. It's for a friend of my mother's. I hope I don't run out of yarn! It's Koigu. I have not used this pattern before so we will see. 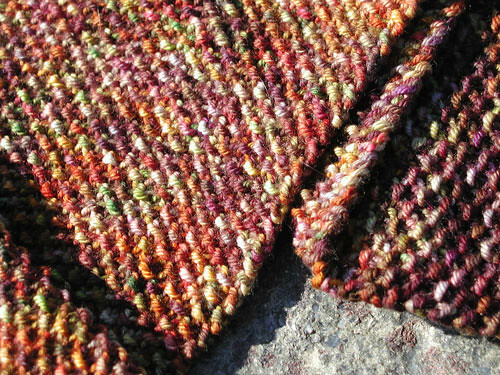 I'd like to knit something in NW Autumn colors. Of course I knit and paint a lot of things in what I guess you'd call New England fall colors - though I've never (yet) been there. NW fall colors are more green with some flashes of red, orange, or gold. What I can see from my condo is mainly green and gold. There are lots of evergreens here so in winter it will be grey and gold. I am glad Seattle has so many trees. I'd like more, of course, but there really are a lot more here than some other places. 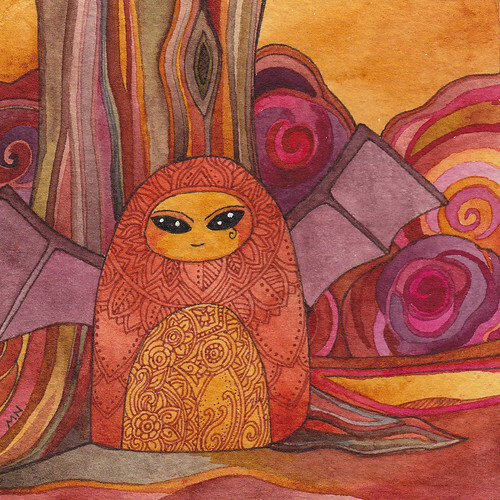 I have been experimenting with some new watercolor paper. One of the pads I got I thought I did not like but I've decided to use it for pen and ink w/ maybe a little watercolor or mixed media. The other one I do like but am still figuring out its properties. So hopefully I will have a new painting to show you soon. My sister sent me some Daniel Smith watercolors for my birthday, and she was surprised how small the tubes are, but they last such a long time! They will probably last me at very least a year. She sent mostly greens so maybe I will paint a NW Autumn. If you remember This post from last week you'll know I was offering the Mustardseed painting to a randomly chosen winner who commented. Thanks to the random number generator at Random.org we have a winner! The winner is #11 - Sue Chesleyo! Sue, please send me your mailing address. If you go to my website - www.megannoel.com, there is a link to send an email on every page. For those who did not win, I will be having one drawing a month, usually around the start of the month, so keep reading for another chance. Also you can always find my work on Etsy. sketch journal page, a photo by megan_n_smith_99 on Flickr. I've been feeling blue for the last few days and not feeling very well. i am sure those 2 things are connected. I have not done much but read and watch depressing movies. maybe i should not watch depressing movies when i am down? but that's just when i gravitate towards them, i think. At least I've been reading some good books.. Camilla and A Live Coal in the Sea by Madeline L'engle. The art install on Thursday at Mosaic Coffee in Wallingford (Seattle) went well. The work will be up until the 1st week of January. See my website for details.My friend Janusz helped me hang the art and I am so grateful I had help. 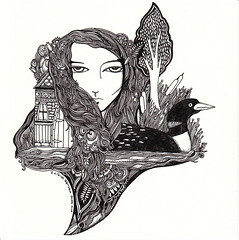 sketch journal, a photo by megan_n_smith_99 on Flickr. Last night was "Shop Till you Drop" - an annual trunk show put on that benefits local women and children in need. This was the first year I have participated. Sales were slow, but that seemed to be the case for everyone and they seemed like a nice group of women so i think i will try again next year. I sold 3 watercolor paintings and handed out a lot of business cards. I was so glad my friend Janusz was there to help me transport and set up art work and to general keep me company. I am a bit high strung and it helps to have a someone with me. Hm, I guess that makes sense since I play violin (sometimes not as often as i should) and he plays viola - which shares 3 strings with the violin and then has 1 lower string. We did, during the course of the evening, between discussions of books and movies, discuss the merits of playing upright bass. I am too small but he could do it. I hope he does sometime. Another page from my sketch journal. When I don't feel well sometimes I just curl up with an audio book or a dvd and just draw without trying to make something good or finished or anything like that. 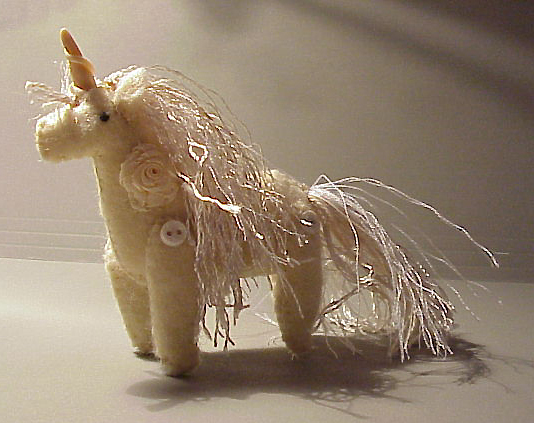 This week I've been listening to the audio book of Madeline L'engle's The Young Unicorns. Today I am doing some chores and then going to the trunk show. Feeling a little frazzled but I will have a helper and I am sure everything will be fine. I just don't have the personality that looks forward to new experiences in general. In general I feel rather tentative of them. Though I am going to take the train to Eugene in a couple weeks - my 1st train trip, and I am sort of looking forward to that. But tentative about actually being in Eugene! Well, I guess this mouse can't change her stripes or spots or whiskers! 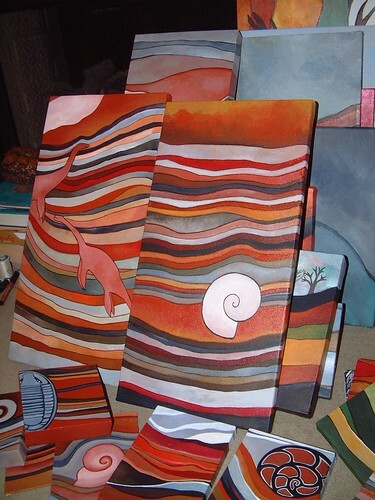 i have spent the last couple days getting my art ready for a trunk show i am doing. it always amazes me how long this takes, even though i should know how long it takes since i used to be a professional "get art ready-er". everything needed to be priced, and places in acid free protective bags with acid free cardboard. some pieces got matted. everything got labeled and i made my list. 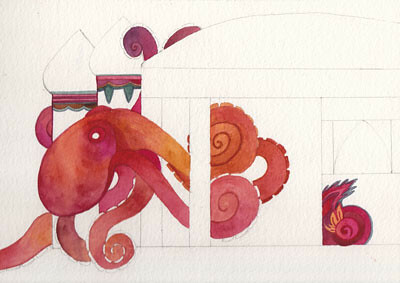 this is less elaborate than what i would do for a gallery, since the only one relying on my information is ME. i wish i'd been feeling better, things would have gotten done sooner. so hopefully tomorrow will go well. then Wednesday i get ready to go hang art in a coffee shop on Thursday. Most of it is ready to go so that won't take too long. I'll see if I can add some more pieces over what i showed in Ballard, it depends on what sells tomorrow and what frames I have in my random frame stash. I might buy 1 or 2 larger frames if I have something to fit in them - and I think I do. My art is going to be at stuff what I like for an extra month! So if you have not made it up there yet, you have some more time. And they are adding soups to the menu, which I look forward to trying. Info on the trunk show and SWIL can be found on the sidebar. Atutumn Bounty, a photo by megan_n_smith_99 on Flickr. 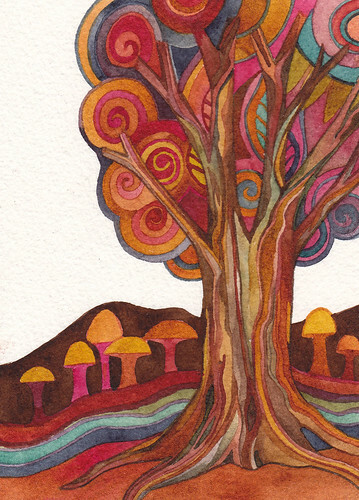 I was quite happy w/ how it turned out and want to paint some more mushrooms. 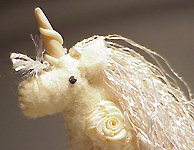 Today I sadly have not done any art, though I have been getting things ready for the trunk show I am doing on Tuesday (info in sidebar), and I have read some. I am almost done with The Enchanted Place, an autobiography by Christopher Milne (aka Christopher Robin). It's not a very long book and I have the sequel as well so I might finish both today. Unless I get some actual energy to do something, like chores, which seems a bit unlikely right now. This is a bit from my sketch book. click on the photo to see the whole thing, for some reason it is cropping strangely lately. the software did not used to do that. it's an "improvement" i suspect. i had a sort of quiet and melancholy day. it's that time of year. And not the easiest week. i did at least go out. i went to the library and pharmacy and got a pumpkin spice latte. i've been reading a lot lately. i reread Sybil, Which has just been debunked, I had put a hold on the 2nd book from the library and thought i might as well reread the first. Then today I read A Little House Traveler, some later writings of Laura Ingalls Wilder. She lead quite a life. First crossing the prairie in covered wagon, later by train, and finally in a car. How the world changed in a short time. When the railroads were first laid out everyone was so excited about them and thought they were amazing. A journey that had taken months could be made in a week. Of course now we've replaced trains with cars and realize we need them back, at least those of us in the city do, so we are having to start over again. Also, Laura and her husband were excited to drive on gravel roads - that was the height of luxury. Well, times change. Her writing about her visit to SF in 1915 for the world's fair were quite enjoyable - and less sparse that the other writing in this book. Her journals were more like logs to set her memories. Her letters were more like the writing she published. It made me want to go back to SF. I've only been once. It's amazing how much it has - and HASN'T changed. It's kind of sad that only one building remains from the fair and it was rebuilt so that may not count! ok. back to my books. Mustard Seed, a photo by megan_n_smith_99 on Flickr. Happy November! Time for my November giveaway. 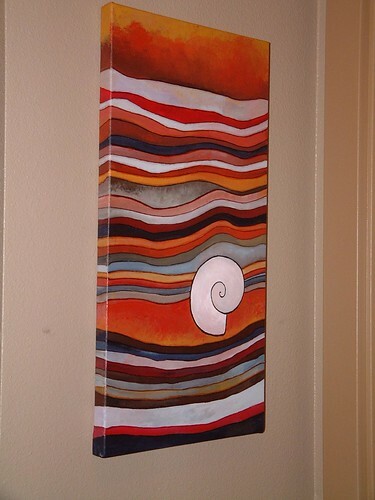 Leave a comment for a chance to win this little painting. I will randomly pick the winners on Saturday, November 12th! 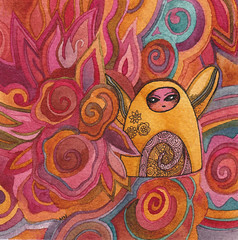 This little forest creature is Mustardseed from A Midsummer Night's Dream. Red Leaf, a photo by megan_n_smith_99 on Flickr. 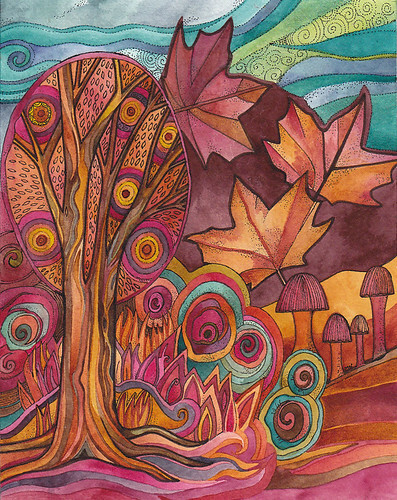 This is another of my recent autumnal paintings. I usually trace real leaves, but then my imagination takes over from there. 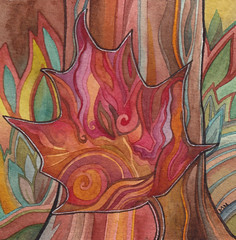 Tree bark is one of my favorite things to paint, though again my version my be a bit fanciful. i have not been feeling well today - oh, the joys of having chronic health issues. at least i did not have anywhere i HAD to so so i lay on the couch, drew a bit, painted watercolor a bit, and did nothing a bit. while watching bones. i can't draw or do watercolor when i am sick but i can't do any big art. not that i am very good at big art anyway. i think i might go make a cup of tea and hide in bed now. it seems like that kind of evening. Forest Creature, a photo by megan_n_smith_99 on Flickr. Well, this week has not gone as i expected it to. My temporary position suddenly ended. I admit I was not happy there but I was happy to have work. Fortunately my unemployment claim was still open and my extension was approved till March. So I am back looking for a job. I do get more art time, and it would still be great if I could eventually do that full time, but it does not seem likely right now. 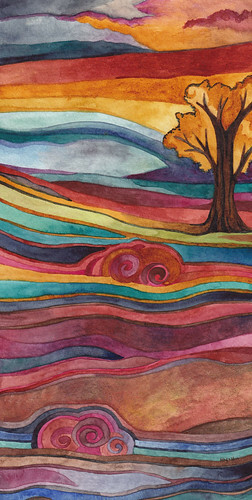 I am going to have artwork at a trunk show in Magnolia next week - see the side bar for details!